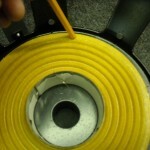 To Clean the speaker, use a utility knife and cut the cone and spider (slicing through the pigtails- also known as lead wire or braided wire) near the speaker frame. Remove recone kit assembly. 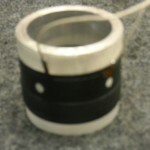 Immediately cover voice coil gap with masking tape. Use utility knife to clean remaining spider from frame. Remove gaskets. 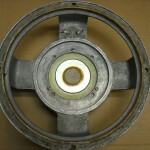 They can be reused if new matching gaskets are not available. 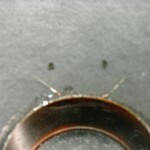 Clean remaining glue, surround, gasket debris from frame. De-solder pigtail leads and clean terminal. 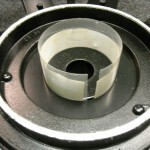 Clean all debris from inside speaker frame and magnet. 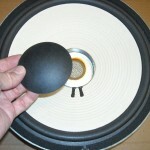 Use compressed air (if available) to blow debris from speaker and eventually from voice coil gap. Add another layer of masking tape over the first to trap any remaining debris. 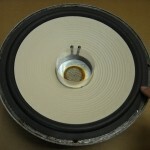 Remove both layers of masking tape from voice coil gap at one time. 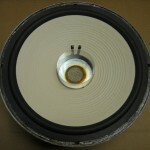 Inspect the voice-coil gap. 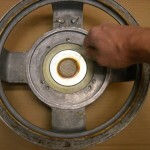 Clean gap thoroughly by folding masking tape over shim so sticky side is exposed on both sides. Insert into gap and circle. Repeat with new tape continually until tape comes up clean. 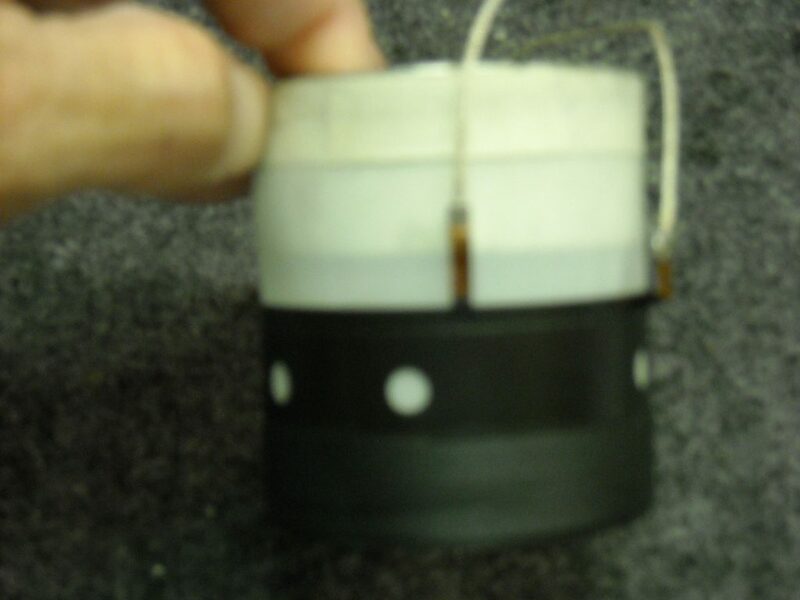 If the original vc coil was burnt, check for windings in gap. 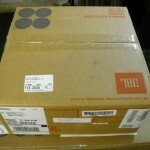 Install the kit without glue to make sure that everything fits correctly. 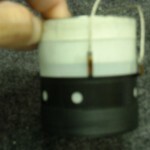 Use shim inside voice coil to get clear view of how the kit fits. Then remove kit, add glue to frame where cone and spider will seat. Install kit. Make sure that the cone is level and not depressed in any way. Press down gently at all points of contact on the spider to the frame and the cone edge to the frame, going from 12:00 to 6:00, 9:00 to 3:00 and then completely around the entire surface. 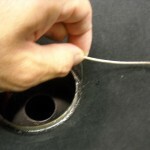 Glue and install gaskets. 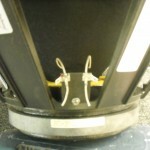 Place the leads over top of shim so they will not be in the way. 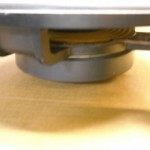 Turn speaker upside down (careful to not let gaskets move) and leave 24 hours. Do not turn upside down if speaker has foam surround that is higher than gaskets unless you have an extra gasket you can use as a spacer. Remove shim. Solder pigtails to terminal on frame leaving “arches” that allow cone to have full range of excursion (be careful not to make arch too long or too short). out. Clip excess lead wire from outside of terminal. 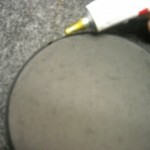 Circle and remove any excess debris. 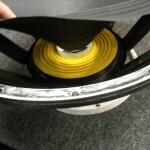 Place dustcap on speaker and glue in place. These instructions are particular to reconing with the EV fixture. Review the general instructions for details and pictures of the recone procedure too. 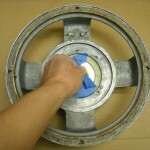 Start by using this link to see the details for cleaning the old parts from the speaker frame. 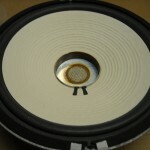 Install Voice-Coil Assembly: Clean all debris from inside speaker frame and magnet. 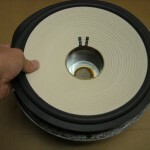 Use compressed air (if available) to blow debris from speaker and eventually from voice coil gap. 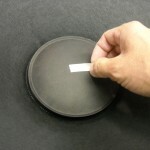 Add another layer of masking tape over the first to trap any remaining debris that might fall into the magnetic gap. 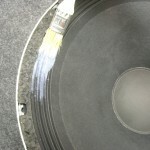 Remove both layers of masking tape from voice coil gap at one time. 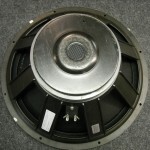 Inspect the voice-coil gap. 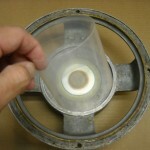 Clean gap thoroughly by folding masking tape over shim so sticky side is exposed on both sides. Insert into gap and circle. 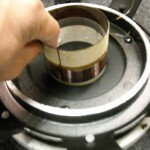 Repeat with new tape continually until tape comes up clean. If the original vc coil was burnt, check for windings in gap and completely clean out. Dry fit all parts together in frame to check fit before using any adhesives! 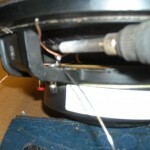 Install the voice coil into gap using the EV fixture with the shim attached until you get a tight fit where the coil fits securely. 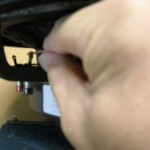 You must be able to insert a thin shim into the gap around the outside of the windings. Inspect to see that vc is set evenly. You should be able to see an equal amount of windings showing on top of the gap from all sides. 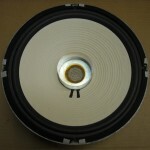 The EV fixture will determine the height of the voice coil. 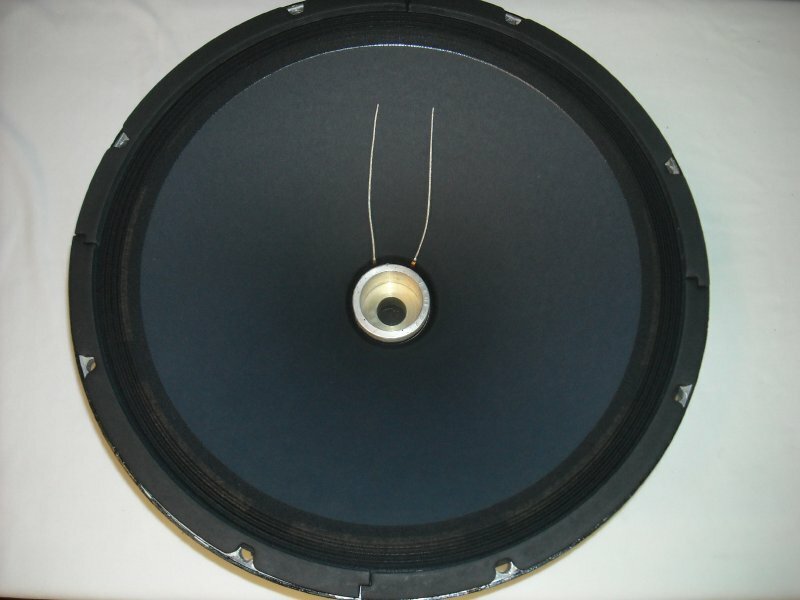 Do not be alarmed if the DL models have quite a bit more of the windings visible above the magnet plate than other EV model speakers. It is important to check that the spider is placed above (not in the center of) the vent holes that are on the vc former. The spider should never rest in the middle of the holes. Remember to install in the gap so the voice coil leads align with the terminal on frame. 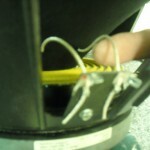 Gently fold the leads over top of shim so they will not be damaged when you install the spider and cone. 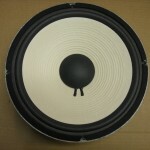 Fit the spider and then cone over the voice coil and lower to frame to test fit. 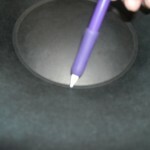 Turn spider gently to insure it is sitting evenly and level. Remove and apply a neat bead of contact glue on frame where spider will attach. Attach spider (gently turn to insure proper setting) and press ends to frame in full circle to insure glue fully adheres to the outside of the spider. (Pictures for this can be found in the general instructions mentioned above.) 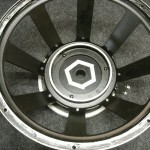 Fit the cone over voice coil and gently turn to insure it will sit evenly on frame. You might find that the cone sits slightly too high. If so, trim a very small amount from lip on the cone throat to fit better. See if cone throat opening reaches spider. If the cone does not reach the spider, epoxy voice coil to spider and then install cone as detailed next. 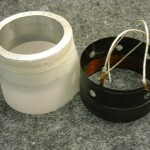 If cone reaches mouth of spider at voice coil, then remove cone, add glue to the outside frame and install cone. Line up with voice coil leads and terminal. Smooth cone edge into glue. Install gaskets. Use a small piece of masking tape to hold in place. 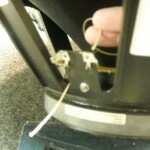 Use epoxy to attach cone to coil making sure that epoxy reaches spider everywhere it attaches to the vc. You might need to slightly lift and lower cone so epoxy forms bead around ID of spider. Smooth epoxy where it meets vc with solder poker or toothpick. 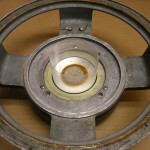 Turn speaker upside down (be careful that gaskets do not shift move). 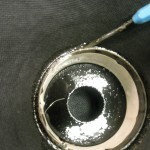 This will insure that epoxy cannot drip into the vc gap. Let rest overnight. 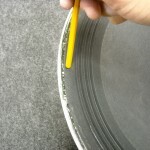 If the foam or rubber edge is taller than the gaskets, you must use a spacer so the surround is not crushed when the speaker is turned upside down. 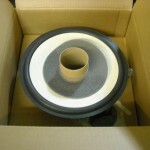 The next day, gently lift voice coil leads and remove the centering fixture and shim combination. Make holes in cone for pigtails if no eyelet exists. Install pigtails through cone if not already in place. 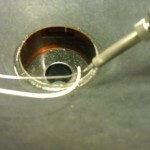 Some models come with the vc leads already attached to the pigtail, but if not, wrap vc leads around pigtails and solder. Solder pigtails to terminal on frame leaving “arches” that allow cone to have full range of excursion (be careful not to make arch too long or too short). Make sure leads face outward from one another so they cannot short out. Clip excess lead wire from outside of terminal. 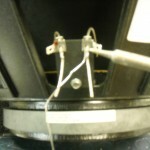 Hold speaker facing down (so debris cannot fall into vc gap) and test speaker. 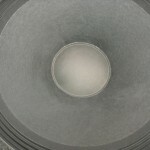 If noisy, try to clean inside the voice coil gap by gently inserting masking tape inside he vc former with sticky side out. 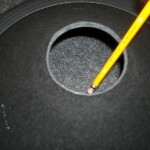 Circle and remove any excess debris. 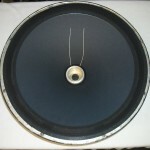 Glue voice coil lead to cone eyelet. 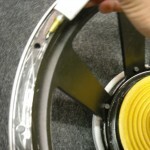 Put dustcap in place and use a bead of glue to attach to cone.. Apply edge dampening agent, dope or latex, if needed. Note: It is important to read the complete instructions before starting repair! These instructions are generic to most brands. Skip the appropriate steps if your recone kit comes with the voice coil already attached to spider or if the voice coil/spider/cone are one assembly. 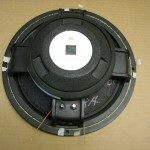 As with all repairs, modifications may be required for specific driver models and brands. 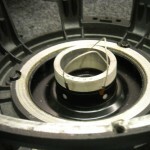 To clean the speaker, use a utility knife and cut the cone and spider (slicing through the pigtails- also known as lead wire or braided wire) near the speaker frame. 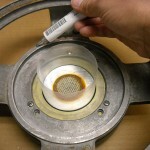 Remove recone kit assembly. 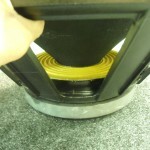 Immediately cover voice coil gap with masking tape. Use utility knife to scrape remaining spider until frame is clean . Remove gaskets. Use knife to break glue bond and peel off. 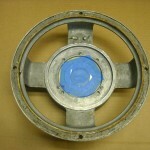 They can be reused if new matching gaskets are not available. Clean remaining glue, surround, and gasket debris from frame. De-solder pigtail leads and clean terminal. 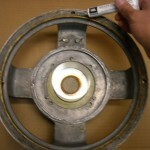 Use compressed air (if available) to clean all debris from inside speaker frame and magnet. Add another layer of masking tape over the first layer to trap any remaining debris. 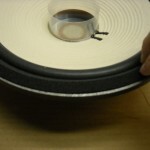 Remove both layers of masking tape from voice coil gap at one time. 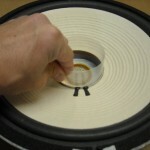 Inspect the voice-coil gap. Clean vc gap thoroughly! (compressed air can also be used if available.) 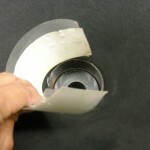 Fold masking tape over shim over 1/4″ card stock so sticky side is exposed on both sides. Insert into gap and circle. Repeat with new tape and repeat until tape comes up clean. 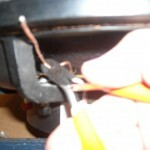 If the original vc coil was burnt or unwound, check for windings in gap and be sure to remove all. 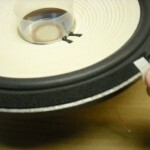 Fit all parts together in speaker frame and check before using any adhesives! 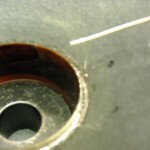 Install shims into the voice coil into gap. 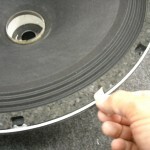 Shims should have no more than 1/4″ gap missing from full circle. 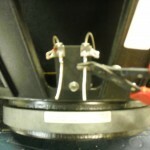 Install voice coil over shims into the gap. 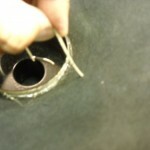 Use different combinations of shims until you get a tight fit where the coil fits snugly. You must be able to insert a thin shim into the gap around the outside of the windings to insure there will not be any vc rubbing. Inspect to see that vc is set levelly. You should be able to see an even amount of the windings from all sides. 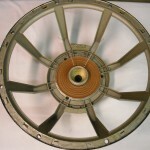 Height of coil is determined by travel of the cone and length of former and windings. 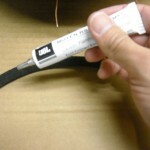 Inspect original parts for a guideline. 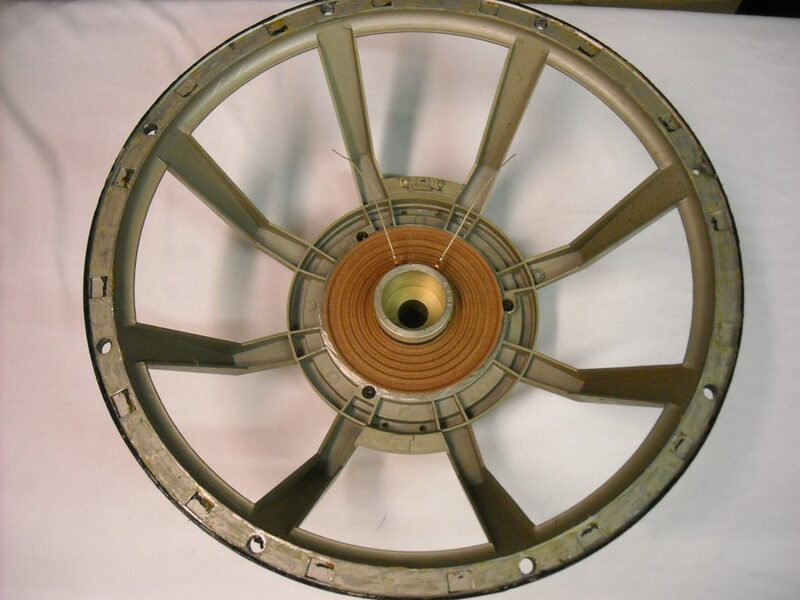 A general rule of thumb is to set the coil so that the distance from the bottom of the shims matches the length of windings. Holding both the shim and vc together, gently hold in position and pull both out of gap to compare distance to bottom of magnet. 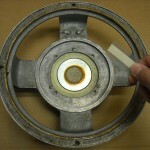 Ideally, the top two windings of the vc windings should be visible above the top plate of the magnet. This is not true for all speakers. 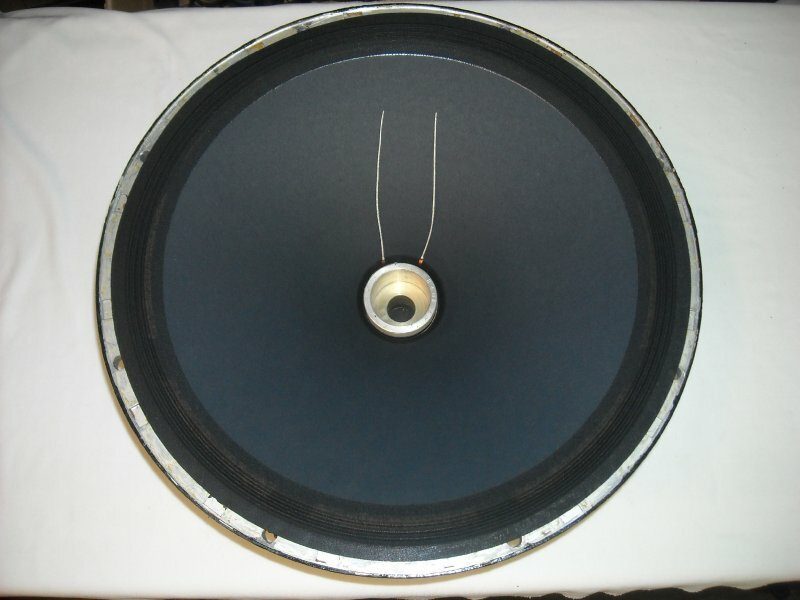 If large travel cone, then set voice coil higher. Remember that if you set it too low, the coil will “bottom out”. 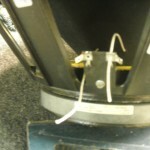 If you set it too high, the coil will cause over excursion and can get damaged or bent. 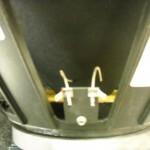 Remember to install so voice coil leads align with terminal on frame. 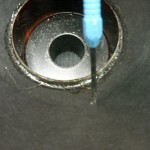 Gently place the leads over top of shim so they will not be in the way of spider and cone. 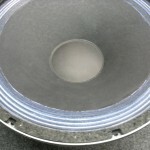 Fit spider over voice coil and lower to frame. Turn gently to insure spider is sitting evenly. If flat spider, remove and apply a neat bead of contact glue on frame where spider will attach. Attach spider and gently turn to insure level setting. Press ends to frame in full circle to insure glue attaches to outside of the spider fully. 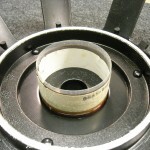 If cup spider, attach spider and gently turn to insure level setting. 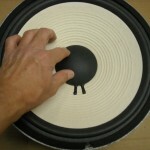 Apply glue to where spider lip rests on the speaker frame. 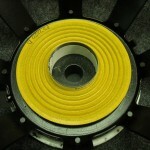 Dry fit cone over voice coil. If opening is slightly too small, use the back of your thumb nail to gently open. If it is much too small, then outline the voice coil on the cone throat and cut with a straight edge razor blade and then smooth with thumb nail. (See here for help). See if cone throat opening reaches spider. If the cone does not reach the spider, epoxy voice coil to spider and then install cone as detailed next. 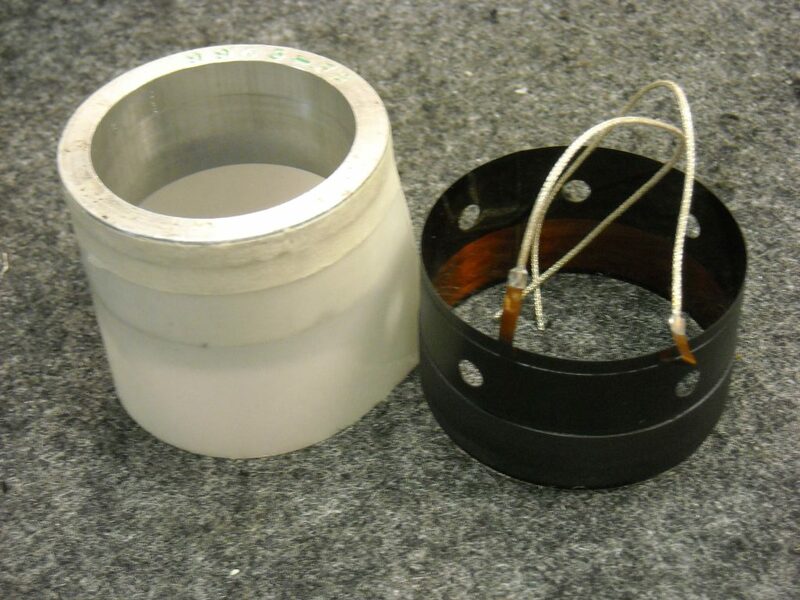 If cone reaches mouth of spider at voice coil, then remove cone, add glue to the outside frame and install cone. Line up with voice coil leads and terminal. Smooth cone edge into glue. Install gaskets. 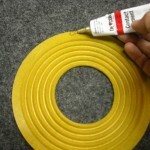 Use a small piece of masking tape to hold gaskets in place. 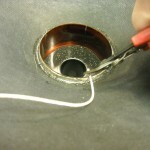 Use epoxy to attach cone to coil making sure that epoxy reaches spider completely. You might need to slightly lift and lower cone so epoxy forms bead around ID of spider. 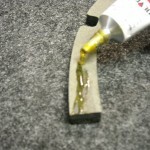 Smooth epoxy where it meets vc with solder poker or other thin tool or toothpick. 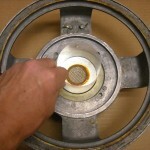 Turn speaker upside down carefully so that gaskets do not move. 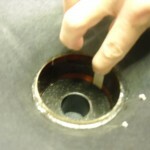 This will stop epoxy from drip into the vc gap. Let rest overnight. 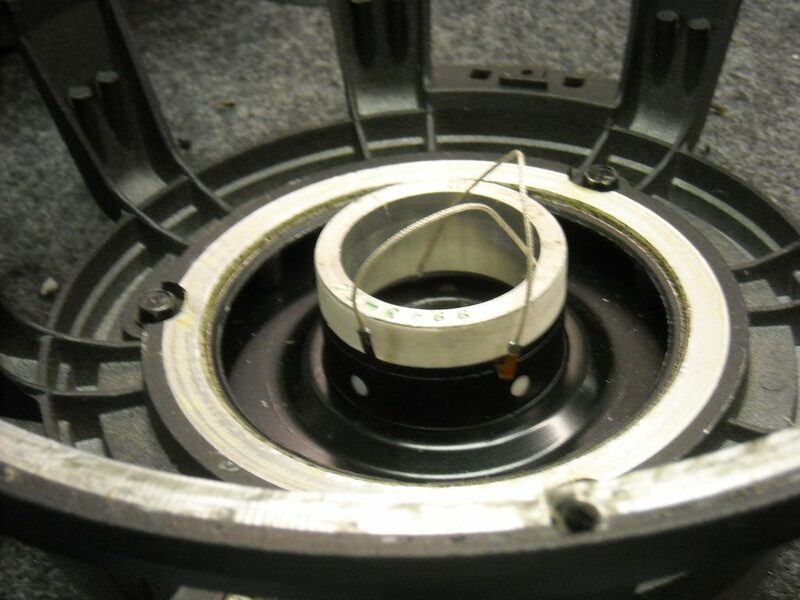 If the foam or rubber edge is taller than the gaskets, you must use a spacer so the surround is not crushed when the speaker is turned upside down. 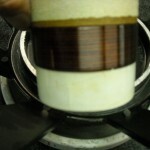 The next day, gently move voice coil leads so you shim can be removed. Make holes in cone for pigtails if no eyelet exists. Install pigtails through cone if not already in place. Wrap vc leads around pigtails and solder. Solder pigtails to terminal on frame leaving “arches” that allow cone to have full range of excursion (be careful not to make arch too long or too short). Make sure leads face away from one another so they cannot short out. Clip excess lead wire from outside of terminal. 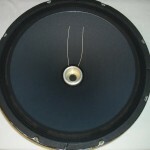 Hold speaker facing down (so debris cannot fall into vc gap) and test speaker. 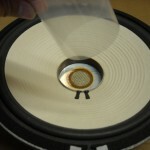 If noisy, try to clean inside the voice coil gap by gently inserting masking tape inside the vc former with sticky side out. 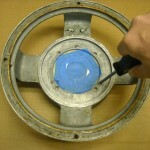 Circle and remove any excess debris. 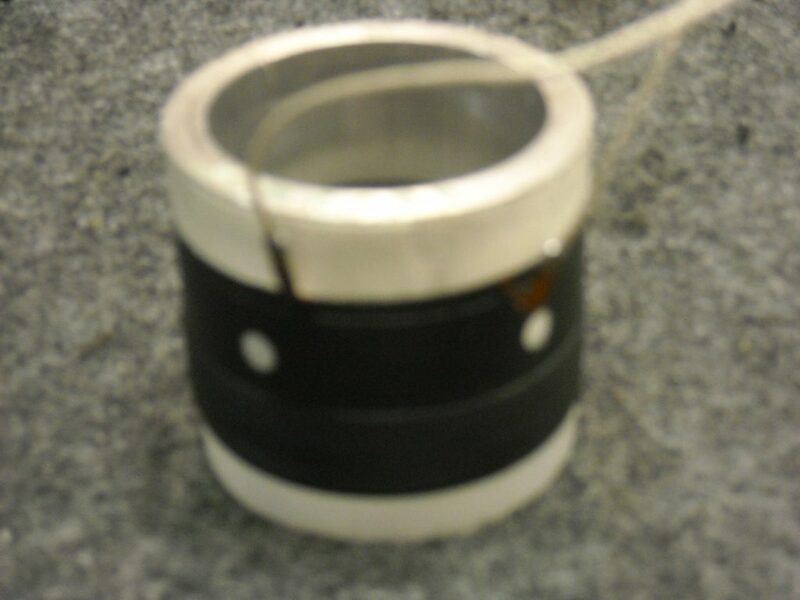 Glue voice coil lead to cone eyelet. 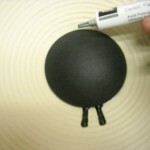 Install glue on dustcap and attach. Apply edge dampening agent if needed. Let dry. 7) dry fit spider onto voice coil. Turn to level. 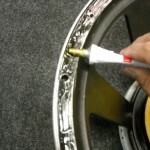 17) dispense two part epoxy onto dry surface. 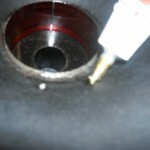 28) press vc lead down top of former, and up cone. 45) Congrats! You did it.